THE EFFECT OF PARENTAL PRESENCE ON THE DENTAL ANXIETY DURING CLINICAL EXAMINATION IN CHILDREN AGED 6-12 YEARS. Maria Shindova , Ani Belcheva. Department of Pediatric Dentistry, Faculty of Dental Medicine, Medical University – Plovdiv, Bulgaria. The aim of the present study is to evaluate the effect of parental presence on dental anxiety in children aged 6-12 years during clinical examination measuring subjective and objective parameters of stress. The study was conducted on 48 randomly selected 6-12-years-old children, divided into two subgroups. Children in subgroup I were examined in parental presence and in subgroup II in parental absence. The dental anxiety degree was assessed using a combination of objective and subjective parameters including heart rate, oxygen saturation and self-report anxiety rating. In each subgroup the mean heart rate is lowest on the dental chair before the examination and highest during the clinical examination itself with statistically significant difference (p<0.001).The self-report anxiety ratings are higher before the examination and lower after it in each subgroup with a statistically significant difference (p<0.001). The heart rate, oxygen saturation and self-report anxiety ratings show no significant differences between the two subgroups (p>0.05). The most anxiety provoking situation was found to be the time of the clinical oral examination itself. After facing the stressful factor the anxiety degree reduces considerably. Parental presence or absence in the treatment room has no impact on anxiety level of children aged 6-12 years during their clinical examination. Shindova M, Belcheva A. The Effect of Parental Presence on the Dental Anxiety during Clinical Examination in Children Aged 6-12 Years. J of IMAB. 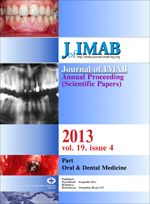 2013 Jul-Dec;19(4):435-438. doi: 10.5272/jimab.2013194.435. 11. Pfefferle JC, Machen JB, Fields HW, Rosnick WR. Child behavior in the dental setting relative to parental presence. Pediatr Dent. 1982; 4(4):311-6. 16. Robert M, Kliegman, et al., editors, Nelson Textbook of Pediatrics, 18th edition, Philadelphia: Saunders Elsevier, 2007, p.389. 18. Erten H, Akarslan ZZ, Bodrumlu E. Dental fear and anxiety levels ofpatients attending a dental clinic. Quintessence Int. 2006 Apr;37(4):304-10. [PubMed].